Not sure your child would enjoy riding lessons, but they have shown interest in horses? Horse camp is a great way to introduce your little enthusiast to everything horse – safety, basic riding skills, grooming, and caring for a horse. Campers learn about the physiology and the psychology of horses and are also educated in proper equipment, fitting, saddling, and bridling. Campers enjoy horse-related craft projects, lectures by the farrier (horse shoer), or learning about different colors and breeds of horses. We have many camps scheduled throughout the school year during summer, fall, winter, and spring breaks. Call today for current rates and registration! Do you and your horse need a little tuneup in the pattern department? Maybe the tip on your loop needs to come down and a weekend of roping cattle would help improve your game? We have a camp for you! Our Weekend Rodeo Camps are typically centered around rodeo events such as barrel racing, pole bending, team roping, breakaway roping, and team penning. We can help get your and your horse partner to the next level – whether it’s helping you follow through on your throw, or getting your horse shaped properly to make a quicker turn at the barrel or pole. These camps are also a lot of FUN! We play games, have a BBQ lunch, go on trail rides, and compete for prizes, and at times, laughs! Bring your horse and an open mind and let’s get your game to the next level! $320/4 days or $85 per day. Sign up for both camps ($560) and save $80! Our summer camps are over – please sign up for our Winter Rodeo Camp! Family and Daily rates apply. Horse rental is $150 for all 3 days. The Rockin’ Redbird Rodeo Camp is open to all levels of riders of all ages! We have kids and adults who are just starting their riding experience to those who are competitive in rodeos and jackpots! Through the camp, you will learn the Rodeo Events: Barrel Racing, Pole Bending and Roping along with progressing in your horsemanship. It is open to all experience levels of riders 6 years and older…..come on adults…come have some fun!!! We will start with basic horsemanship skills and drills building a confident foundation, and have 2 full days of instruction in the events. 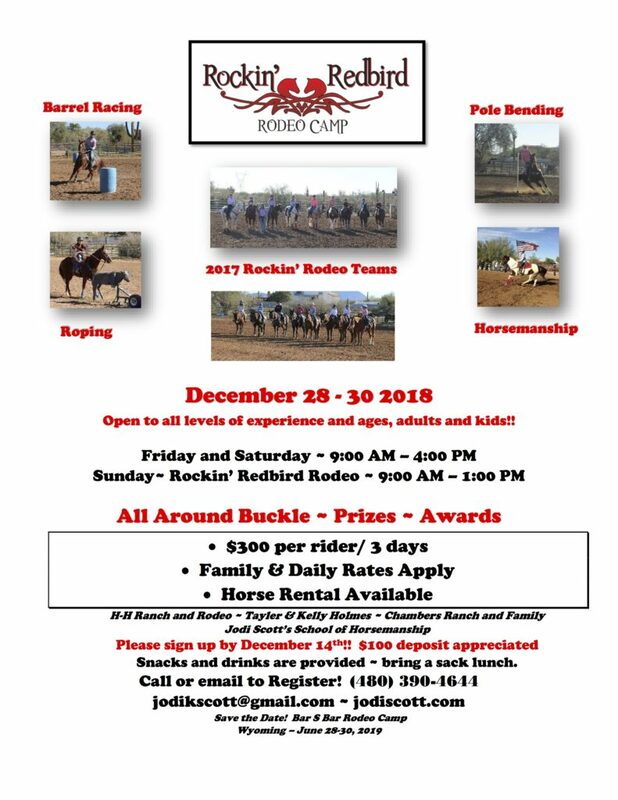 December 30th will be the Rockin’ Redbird Rodeo, where contestants will compete as a team for awards and event prizes……as well as an All Around Buckle to the Champion of all the events combined! This is a really great way to be introduced to the Sport of Rodeo! If you are just beginning or want to strengthen your competitive edge, this will be a great experience! $225/3 days – Riding, grooming, painting, crafts and more!